Minimalist game play design was was was the main focus with this, and I'm glad to see it turn out fun for people. Good game! The level design is really great. Thanks! I really appreciate it. I just played your game and it was fantastic! What a great game! That's an awesome hook and you executed it perfectly! This is really cool. Is the enemy generation purely procedural or is that a specific pattern? Fantastic game! Great music, great sprites, great animation. Very difficult, but very satisfying! Good Work! The art direction is phenomenal. Level 4 is particularly cool. Ok. Between work and the fact that I'm gonna be traveling this week, I've realized that I'm never gonna get this game in the shape I want it to be by the deadline. So, instead I'm gonna turn this into a sort of interactive showcase for my low poly models(there might be two of them). I'm definitely going to revisit my idea for SP later, but I'm going to have to get a better grasp of unity first. Due to scheduling conflicts, I need to get character modeling out of the way first while I have certain hardware available to me. Here's the model for the Iudicium. This is the 3rd 3d model I've ever done and the first with completed textures. 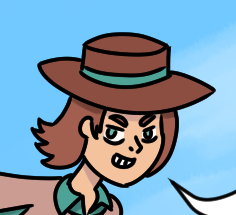 I'll be able to get rigging and animation done on Thursday. Okay Kids, Story Time! A couple years back I was in a real bad spot mentally. While I was going through the troubles, I came up with an idea for a game that could represent what I was going through. That game was SP. Now that I'm in better place mentally and in terms of skill, I've decided to come back to the idea and make a functional prototype of it. I'm going to be making this in unity. I have a whopping <6 hours of experience with it so this should be fun. I did manage to learn about unity's built in first-person character controller and raycasting, so I'm not going in totally blind. I might be using Bosca Ceoil to make music, but if anyone has actual musical talent and would like to compose for a horror game, maybe we could work together??? SP is a first-person abstract horror game where you must navigate through rooms filled with creatures known as Iudiciums(pictured above). If you look directly at the Iudiciums, the world will distort around you. If you look at them for too long you will die. 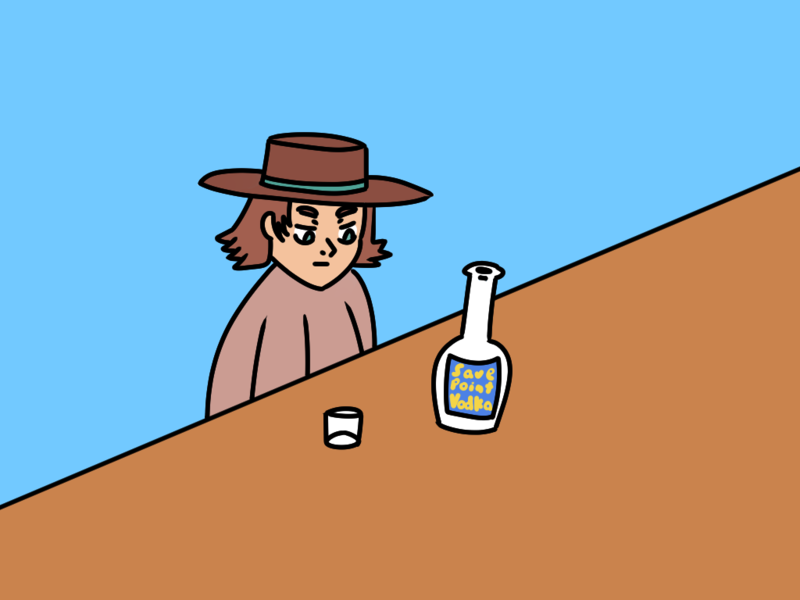 For the last game jam I made Dang Cowboys in My Bar, aplatformer that is way more cheerful than this game will be. Hopefully, I can make this game at least interesting to play. I look forward to deving with you all. the project as described above has been scrapped in favor of an interactive model showcase. 1. Hey, I'm Zalonar/Zal and I don't know how to talk to people...hi! 2. I was in the last game jam and made a three level platformer. This go around I'm gonna try to use unity to prototype a game idea I've had in my head for a few years. 3. Some of my favorite games are LoZ: Wind Waker, Kingdom Hearts 2, and Skullgirls. They definitely inspired me to make games. Particularly MikeZ's streams showing the updates he was putting into Skullgirls made really want to make my own. 4. My main game dev experience comes from making platformers in GameMaker. I mostly just plan out gameplay mechanics in my head and draw character concepts. I'm learning Blender right now for 3d models, so there's that! 5. Mechanics! How things move! art/animation/gameplay! I love seeing how the little parts of something affect everything else in it. I'm a huge fan of Mechanics-As-Metaphor in games, so if I can tell a story in a game with how it plays, I'll be happy! Great pixel art and a great atmosphere. Your level design gives a pretty interesting challenge. I'd like to see this expanded on. But I did it! 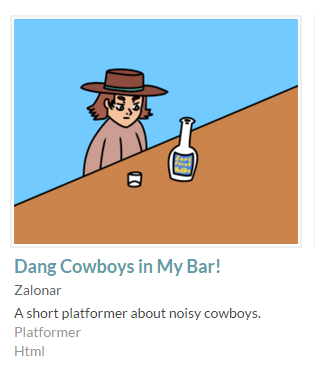 Dang Cowboys in My Bar is uploaded and submitted! There was a surprise bug when I first tried to upload it, but I fixed it! I hope you enjoy the short little game I made! Collision masks are tough. I had the same problem in my game. Good work fixing it. The game is done. Or as done as a two week first game/proof of concept can get. I'm going to wait until tomorrow to actually submit it. I'll probably play through it a few times to make sure nothing's blatantly busted. All three levels are done (with a surprise in level three >:3c). Victory screen is done. Here's a sneak peak. Tomorrow, I'll see if I can work in an "opening cutscene." Title Screen is done. All assets are done. The game probably won't have sound but whatever. Tomorrow I'll finish level 3 and the Victory Screen. After that it's all polish. Levels one and two are done! The title screen and victory screen are bare-bones but implemented. Tomorrow, I'll make art assets for them. Y'know, level design is pretty fun. Maybe I should get that there "Mario Maker" all the kids are talking about. Trust Me. I Did Something Today. 1. Set up the architecture for multiple levels. 3. Sound. I've got a site that I can use to generate some sound effects, but I don't know what I'm gonna do for music. or if I'm even going to be able to put in music in time. Oh well. I guess I'll figure that out tomorrow. I got more done yesterday than I thought I would. None of which would show up in a capture. So, today I'm gonna hangout in the discord room while I work on making a level. Enemies now have animation! It's kind of hard to see with the gifs frame rate, but it's there. Next up is building the level. I'm going to make this thing look like an actual videogame! Enemies now do what they're supposed to do sans animation which I'm gonna work on next. Once I finish their animations, I'll tweak how they shoot. I've been working on a lot today actually. More than I thought. 1. Save point: currently works well enough that you could almost say there's gameply in my game. 2. Bullet: does its job and animates. It doesn't move yet, but it "kills." 3. 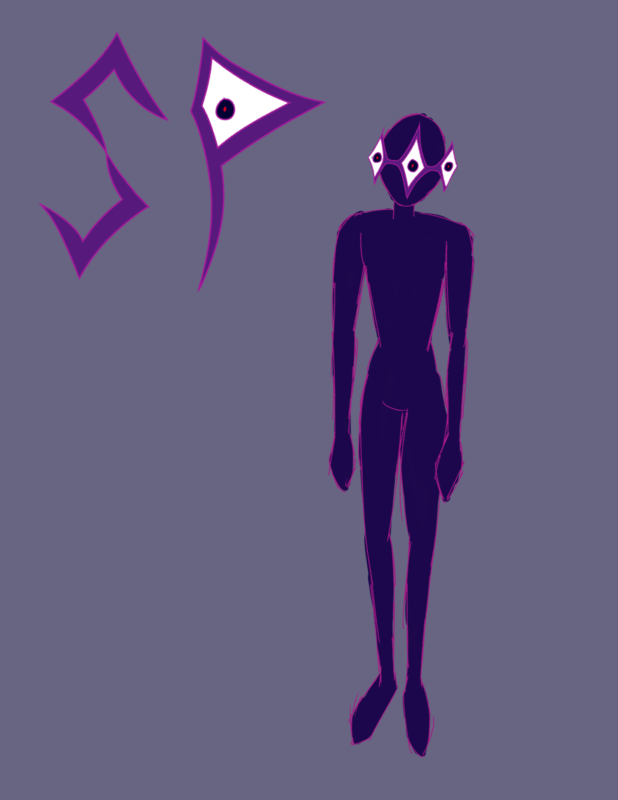 The First Enemy: is just a sprite. I does absolutely nothing right now. p.s. @Alamantus You were half right. The shortcut is now shift+ctrl+left click. Thanks for helping out! Were you using the free version of GameMaker? If that's the case, then you should be able to export/make a windows executable(if you're on mac this might not help). Yo, I love your art! All animations for Straw's movement are done. I decided to add a background and change the sprite for the walls. I'm probably going to change the background at some point, and I'm definitely going to change how I handle the walls. On a related note, does anyone know if there's a keyboard shortcut in GameMaker that lets you place objects in a sort of "brushstroke" way?